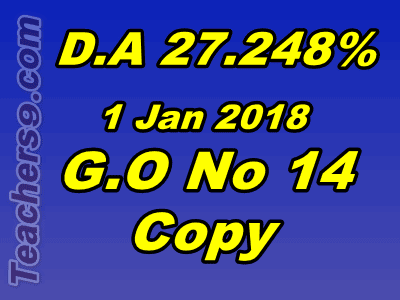 Government hereby order the revision of Dearness Allowance (DA) sanctioned in the Government to the employees of Government of Andhra Pradesh from 25.676% of the basic pay to 27.248% of basic pay from 1st January 2018. The Dearness Allowance sanctioned in the paras 1-10 above shall be paid in cash with the salary of April 2019 payable in the month of May 2019. The arrears on account of payment of Dearness Allowance for the period from 1st January 2018 to 31st March 2019 shall be credited to the respective General Provident Fund Account of the employees in the month of April 2019. Employees who are retired from service between 01.01.2018 and 31.03.2019 and in respect of those employees who are due to retire on or before 31st July 2019 the arrears of Dearness Allowance shall be drawn and paid in cash as the employee due for retirement on superannuation is exempted from making any subscription to the General Provident Fund during the last four months of service. In respect of employees who were appointed to Government service on or after 01.09.2004 and are governed by the Contributory Pension Scheme (CPS), out of the arrears payable for the period from 1st January 2018 to 31st March 2019, 10% shall be credited to the PRAN accounts of the individuals along with the government share as per G.O.Ms.No.250, Finance (Pen.I) Department, dated: 06-09-2012 and the remaining 90% of arrears shall be paid in cash in three equal instalments i.e., 1st April, 2019, 1st May, 2019 and 1st June, 2019.